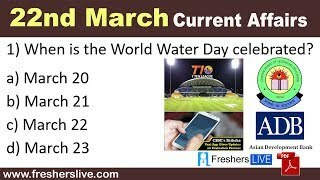 Current Affairs 22nd March 2019: Instantly obtain Latest Current Affairs 22nd March 2019 with all essential info, Be the first to know all the Current affairs 22nd March 2019 top news, Major Issues, Current happenings, Important events in National as well as International level with clear explanation. For all competitive exams and Interviews, equip yourself with the Latest Current Affairs 22nd March 2019 granted here. Central Board of Secondary Education (CBSE) launched its podcast app, 'Shiksha Vani'. It will be used to send out major announcements made by the board and is expected to be the quickest way to information. The first official circular on the app confirmed the beginning of the evaluation process of the 2019 Board Examinations.